Rarely do I receive a recording that makes me stand up and take notice. My jaded and tired ears perked up as I flew my astral plane while playing Veils of Mystery. What's this you ask, a trip to Nirvana via Peter Frohmader's Nekropolis label, the label noted for dark, ponderous, avant garde music? Stranger things have happened. The beautiful eastern-influenced music contained herein hearkens back to Witthuser and Westrupp's Der Jesus Pilz or Yatha Sidhra's A Meditation Mass. There is also a golden thread of contemporary ambiance running throughout the 76 minutes that never falls prey to New Age. Gulââb (Nepali word for rose flower) spent three years refining his spherical sound in Nepal by playing acoustic guitar in a restaurant for such luminaries as Edmund Hillary, Reinhold Messner, and the King of Nepal. 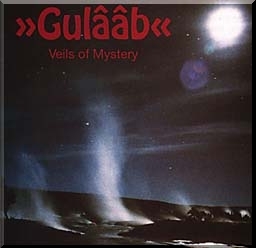 Using acoustic guitars, flutes, African percussion, sitars, and occasional synthesizers Gulââb guides you on a serene pilgrimage to the mountain top. Interestingly enough Peter Frohmader plays synths and samplers yet if I hadn't told you, you would never have guessed! This uplifting CD is one truly amazing musical experience guaranteed to soothe the savage breast. Just feast your eyes on the track titles: " Interstellar Sunrise," "Rainy Day in Moscow," "Oracle," "Diana," Dance of the Nymphs," "Midnight Bazaar," "Herode's Dream," "Dwarfs," "Styx," "Silver Star," "Tahiti," "Time's Tribute," "Ride through Hades," "Sphinx," and "Morpheus." Veils of Mystery is one of the best, most unexpected, and unusual releases of the past 12 months. Highly Recommended. Who Are These Strange Artists?